Their move will be a good one. Louis and Rachel Creed are sure of it. Yes, the sleepy little town of Ludlow, Maine, will take some adjusting to after living in the ever-beating heart of Boston. But the plusses are obvious. By leaving his big-city nightshift job and taking a more prominent position at the local Ludlow hospital, Louis can actually be a doctor who sees his family once in a while. And the improved economic situation will allow Rachel to be a stay-at-home mom. Eight-year-old Ellie and toddler Gage are bound to thrive. On top of that, the big house they were able to purchase is on a wonderfully large stretch of land covered in hills and lush trees. I mean, it’s like having a national park in your backyard. There’s no question: This is a good move. It will be a healthy, thriving, life-giving change of pace. There are a few drawbacks, however. For one, the country road that runs in front of their property tends to be populated by trucks that scream by at reckless speeds. Someone could get hurt if they’re not careful. But their nearby neighbor, an old withered gent named Jud, says they’ll get used to it. And he should know: He’s lived here all his life. Louis and Rachel have really grown to like old Jud. He’s been a settling, calming presence in their lives in the short time they've known him. And he’s definitely taken a shine to little Ellie, who has charmed him with her bounding dances and youthful joy. Yep, Louis and Rachel are certain that things will be good from here on out. But then their cat, Church, gets hit by one of those speeding trucks. Rachel is afraid Ellie will be devastated, especially since it happened so soon after the move. Jud feels so sorry for the dear girl. He suggests that he and Louis bury the cat that night. Turns out there’s this place called the “pet sematary” where local kids have buried their pets in ritualistic fashion for ages. It’s actually just a short walk into the woods behind the Creeds' house. 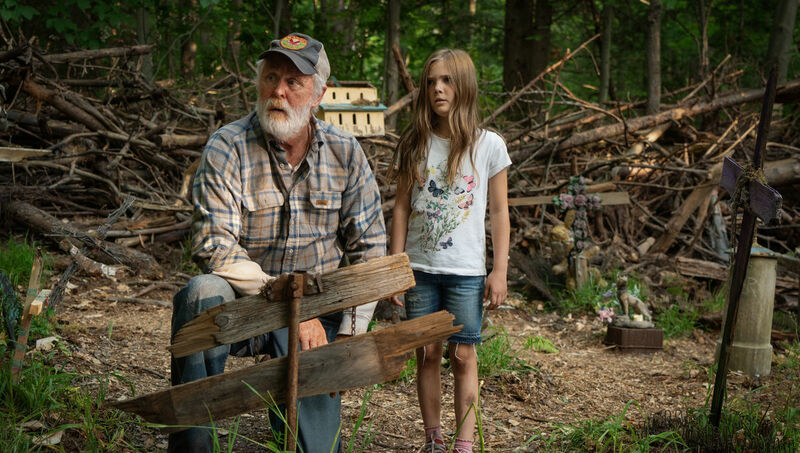 But, Jud tells Louis, if he’s really concerned about little Ellie’s feelings, there’s a stretch of swampy land just behind that burial ground that might make for a better spot. Louis isn’t sure why they’re taking an extra trek through this muddy, mist-clogged place. Or why they're burying the cat on a particular hilltop, then stacking a stone cairn on top of it. But Jud assures him that it will be worth the effort. And when Church unexpectedly climbs through Ellie’s window the next morning, well, it seems ol' Jud might have been right. One look in the cat’s eyes, though, makes it pretty plain that Jud wasn’t right at all. In fact, things suddenly aren't going as well as Louis and Rachel had hoped. Sometimes dead is better, don’t you know? And no one should mess with things that are dead … or used to be. Interested for my works and services? Get more of my update ! © Copyright 2016 Fadly — Senior Designer & Digital Art Director from Indonesia. Distributed By Protemplateslab & Designed by Bloggertheme9.